I grew up eating these, but my mom always fries hers. I was hoping to make them lighter by baking them instead, and the results were great. I sprayed them generously with oil then baked them. Top them with a little turkey gravy or chicken gravy and serve with and a vegetable on the side. These also make great appetizers. You could substitute chicken breast for turkey if you wish. Enjoy! Not sure what to do with all your leftover turkey? 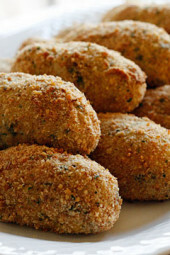 Croquettes are a perfect way to use your leftover turkey! Saute garlic, and onions in oil on low heat. Add parsley, salt and pepper and cook until soft, about 2-3 minutes. Add turkey, and remaining broth, mix well and shut heat off. (about 1 tbsp worth). Bake in the oven about 15 minutes, or until golden. Do you think these would work in the air fryer? Have been wanting to make these for awhile, and wanting to take some things to my 96 year old parents thought this would be good. Used left over frozen turkey mostly dark meat however, so I figured would have to add some calories to the dish, but tried to make up for it a bit with egg white and didn’t use oil to saute, just some of the broth. Added a bit of poultry seasoning and thyme, too. Loved these. Great use of leftovers that makes turkey shine again. Thank you. It should be fine but it will change your cooking time as you will have to brown the turkey as opposed to using leftovers. I used your recipe as a guideline – I used leftover mashed potatoes (3 cups) and a little more chopped turkey (probably 14 oz instead of 12) I used a food scale to measure that. Also used dried parsley as I had no fresh. Formed them into patties and I did fry them (sorry) in olive oil. They were pretty good. My husband really liked them. I'll make these again when I have leftover turkey or chicken. Would it work ok with cooked low fat turkey mince? SO this may be a dumb question but I want to make this for dinner tonight and bought all the ingredients but realized I don't know how to make the "12 oz cooked turkey breast, chopped fine". I am not using any leftover turkey so I bought fresh, raw, turkey breast at my meat counter but how do I cook it for this recipe? Do I bake? Boil it? Do I season it? Please help if you have made this before and have tips! Thanks! Roast it in the oven. I wanted to make a dipping sauce for this dish. What would you recommend? It would be great with turkey gravy. I made these last night for our Halloween party at work. Everyone seemed to enjoy them. I did make a few adjustments though. I used chicken instead of turkey because that is what I had roasted the day before but instead of using potatoes I used roasted cauliflower. Which turned out well. I added too much chicken and it over powered the cauliflower but everyone still ate them up. Since this was my first attempt I now know how to adjust this to continuie to make it w/the cauliflower. and because I the mixture was pretty moist i did not have to dip them in egg before the bread crumbs they stuck and cooked perfectly. Thank you for the site. It has been new discover for me and I have been sharing it w/everyone! Thank you I was wondering if you could replace the potatoes (since I'm allergic) with something … cauliflower! Fantastic! 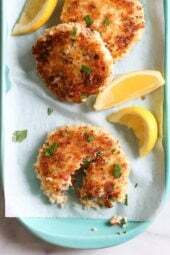 I made these with salmon recently and they were a big hit! I heard a tip on a PBS cooking show this weekend that I think I will incorporate next time. The chef suggested using a baked potato instead of boiled which made sense to me as it would be more dry. (He was making crab cakes.) Anyway, I served these with a little mayonnaise and dill. Thanks for posting it. I just made this recipe. I used chicken because I don't have any left over turkey and it is fantastic. I added celery too because wanted to use some up and I was happy with the outcome. I love your site. I have tried so many recipes on here and am impressed with every one. You make me motivated to stay on Weight Watchers by giving me all these great idea that my whole family loves and that keep me on track. Down 42 pounds so far and I credit your recipes for helping me get there. Thank you for all your wonderful recipes Gina! I had so much leftover turkey from Christmas and was very excited to try this recipe. I only had 3 smallish/med potatoes so I added in 1/3 head of a big cauliflower and they came out SO good! They were a bit mushy to work with but no one noticed any mistakes after they were baked ~.~ I LOVE your blog! I made these last night with the last of the Thanksgiving turkey. Very flavorful- we liked it a lot! I've never made croquettes before so this was something new for me. Very impressed and will make again! Thank you! 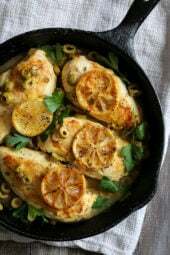 This recipe will be good with left over salmon or steelhead trout as well. Maybe add some dill and a touch of dijon mustard to the mix. I will be making them as written for supper tonight, with left over Sweet Potato Brulee, cranberry sauce (thinned a bit for dipping) and broccoli. Thank you for your recipes. Being a long time Weight Watcher, I am always on the look out for recipes easily modified (if at all necessary) for Simply Filling/Core. Yes this would freeze good, before or after you bake it. I make this with Leftover chicken, beef, turkey, even with cod fish! Hi Gina; I have leftover turkey and would love to try these. Do you think they would freeze well? Would you freeze them before cooking or after? Thanks, I have enjoyed every recipe I have tried! Made this for dinner tonight! I used 99% lean ground turkey and dried parsley (as I didn't have any fresh) and panko crumbs. I whipped up some gravy using whole wheat flour, butter and chicken broth, served with a side of veggies and a dollop of mashed potato. So good! Even my husband liked it, and he's a pretty picky eater! My recipe made only 12, so about 100 calories each. Leftovers will be good tomorrow for lunch! Tried with with 93% lean ground turkey, and they were wonderful. Just might need to cook it a little longer. Also for dipping sauce, I made a mix of coke zero bbq sauce with some hot sauce. Delicious. Thanks for the recipe Gina! I made these last night with ground turkey and boxed mashed potatoes (I know, I know) but they were a little mushy and hard to form into a ball. I don't think it was the ground turkey that made it like that, must have been the potatoes. Still very good, if a little messy to prepare. I suppose they would work, but I've never actually tried it that way. 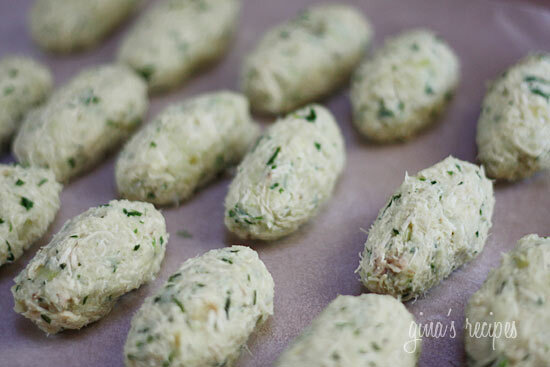 Do you think these would work with ground turkey? I didn't have leftover turkey and thought since you put it in the food processor it would work the same. I was planning on trying it tonight, but a bit wary about the ground turkey. You could use Yukon gold, russet, Idaho, not sure how they would taste with sweet potato though. 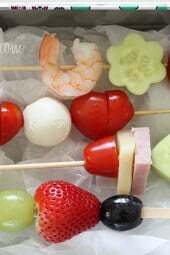 These look great- would it be possible to make with sweet potato as well? Just made these. I cut the recipe in half, because I was just cooking for myself. They are quite tasty! For dipping sauce, I used some low fat ranch dressing and added some chipotle Tabasco sauce for a little kick (I'm in Texas, Tabasco is a must). It was delicious! Thanks! That's great to know, thanks!! Ann, good question, let me think about that one! I made these last night and they were a hit! Three cups of leftover mashed potatoes works out perfectly. I did find that I didn't need the egg wash to get the breadcrumbs to stick (and we couldn't taste a difference between the two). 🙂 Thank you for another winner, Gina! Yum! Sounds like a great hearty appetizer. Any ideas for a dipping sauce? I made this last night for dinner, used up some of the dark meat since nobody was eating it so it added a bit of fat, but everyone enjoyed them – and I was serving some picky eaters! 😉 Thanks for the recipe! Sarah, as long as they taste good, that's all that matters!! I tried them yesterday and they definitely tasted great! 😀 Thanks for writing the recipe! Yours are definitely a lot prettier than mine turned out. They are super yummy though! Great way to use up the leftovers! Bet this would be great with sweet potato too! So excited to try these!! 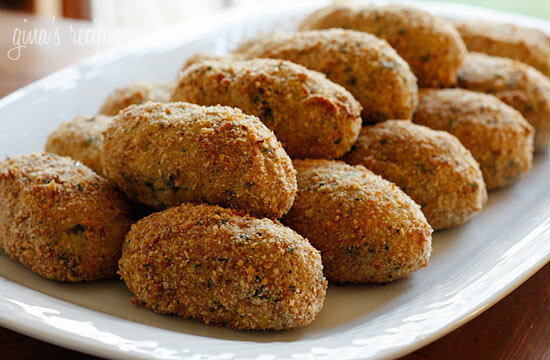 My mother in law used to make my husband "chicken balls" on special occassions and he loves and misses them. Now I get to make my own "turkey balls" for him without all the heavy cream and frying, and without having to compete with her recipe!! YAY! Mom mom used to make them with cod fish, never had them with tuna. I love them with fish! I absolutely LOVE your recipes. Thank you SOOO much. My daughter is 9 months old and thanks to Weight Watchers I've lost all my pregnancy weight (and then some!). This recipe looks awesome. My Mom used to make these with tuna growing up. I will try both the tuna and turkey using your recipe! Thank you SOO much for your blog! Mother Rimmy, No I haven't tried it with panko. Great idea! Melissa- good question! Maybe 3 cups. I'm sure that would work. Jasmin- it's great with chicken too! That's a great idea. Thanks Giving or not. I'll have to try that with chicken also. 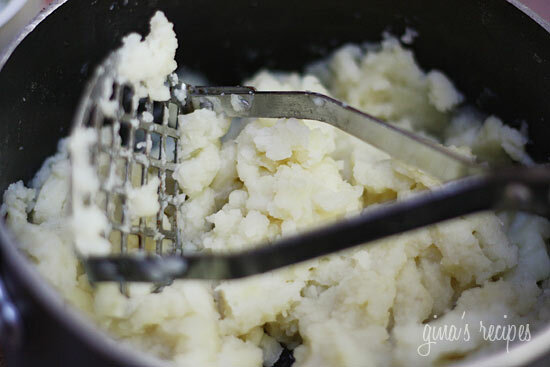 If you are using leftover mashed potatoes, about how much do you think = 3 potatoes? I've never seen this use for leftover turkey. Great idea. 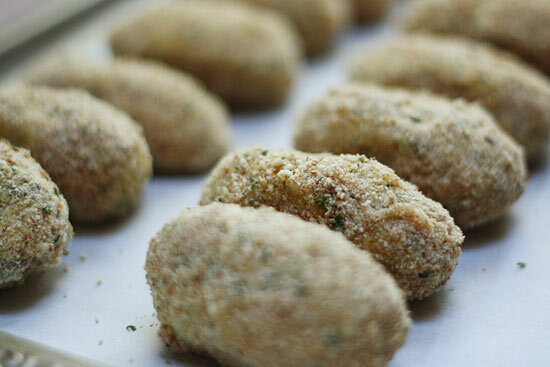 Have you tried panko bread crumbs? I love them for baking. They give food that crunchy "fried" texture, without frying. Happy Thanksgiving!